Say. 1830. 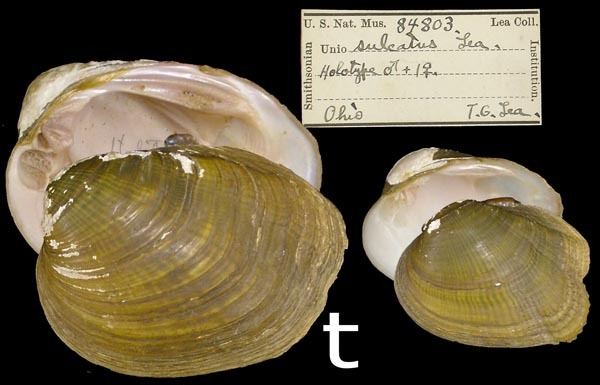 American Conchology, or Descriptions of the Shells of North America 1: pls. 1-10. Lea, 1828, Trans. Amer. Phil. Soc. : 269 [as ‘Unio ellipsis var. a’]. Lea, 1829, Trans. Amer. Phil. Soc. : 430, pl. 8, fig. 12. Say, 1830, Amer. Conch. : pl. 5, lower figs..
Barnes, 1823, Amer. J. Sci. : 272, pl. 13, fig. 17. Say, 1830, Amer. Conch. : pl. 4.